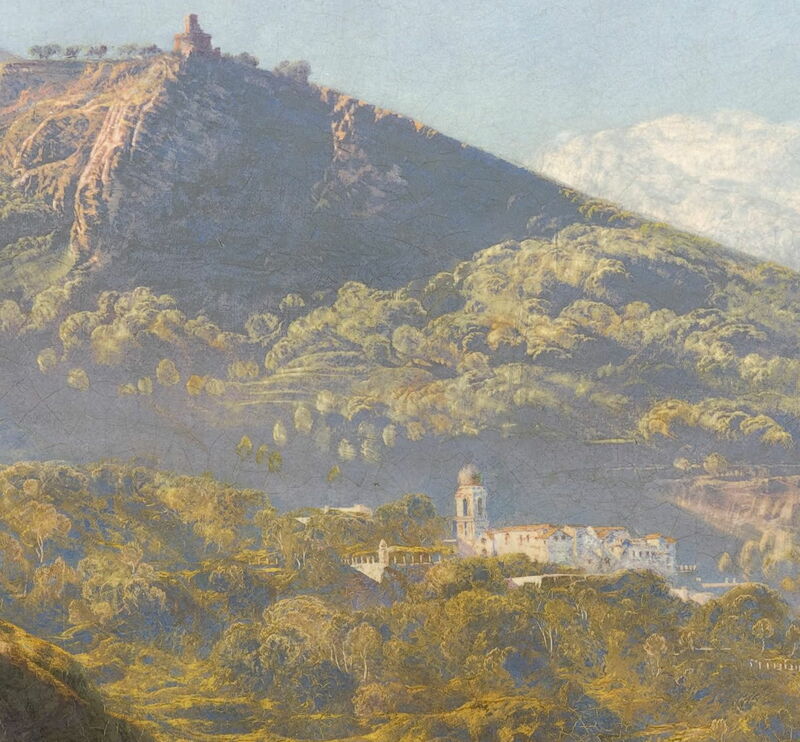 John Brett (1831–1902), Massa, Bay of Naples (detail) (1863-64), oil on canvas, 63.8 x 102 cm, Indianapolis Museum of Art, Indianapolis, IN. Wikimedia Commons. Most artists had abandoned trying to paint Pre-Raphaelite landscapes by about 1862. Perhaps the most persistent painter in Pre-Raphaelite style was John Brett (1831–1902), who by any account continued to produce paintings which conformed to Ruskin’s ideals and had the same ‘look’ until at least 1870. This article and the next look at his work, and how it changed after 1870. Brett was a relative latecomer to the Pre-Raphaelite circle. Although he, and his older sister Rosa, started painting professionally from about 1850, John Brett was not admitted to the Royal Academy Schools until early 1853, by which time the PRB itself was dissolving. When in London, he made contact with artists of the Pre-Raphaelite movement, and discussed their art and techniques with Holman Hunt in particular. He read Ruskin, and admired the paintings of John Constable. Having painted portraits to bring in some income, in the summer of 1856, he went to Switzerland, where he ascended to the glacier above the village of Rosenlaui, and painted his first real landscape work. 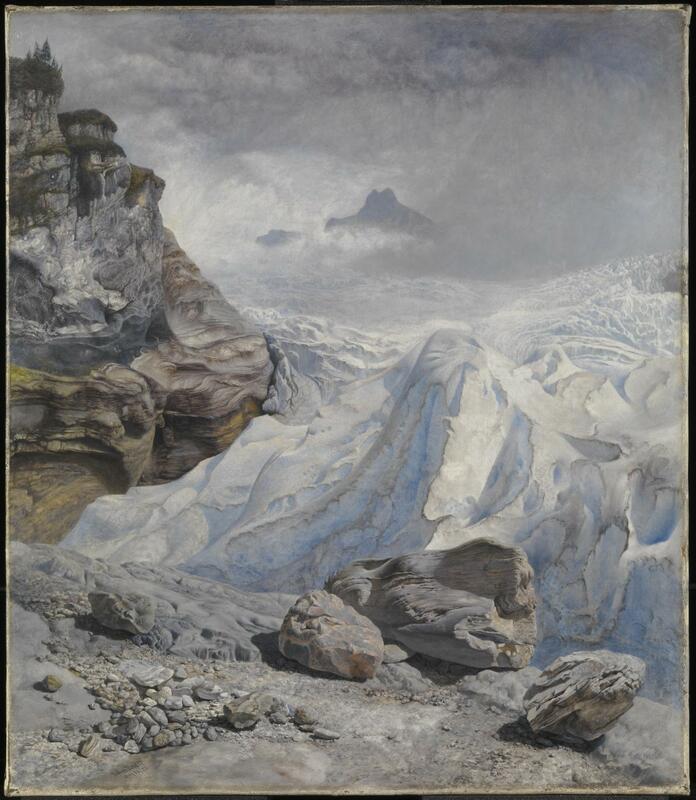 Glacier of Rosenlaui (1856) is an extraordinarily accomplished initial landscape painting. Influenced by the fourth volume of Ruskin’s Modern Painters, and the nearby work of John William Inchbold, who was painting about ten kilometres away at the time, it appears to have been painted entirely en plein air, in front of the motif. Despite its great detail, particularly in the foreground, as prescribed by Ruskin, he signed and dated it 23 August 1856. Brett also painted a few impressive watercolours before returning to England. In December, this painting had impressed Dante Gabriel Rossetti and Holman Hunt, and had even received praise from Ruskin himself. But the painting did not sell. The following summer, Brett started work on a less technically-challenging and hopefully more marketable painting, which was possibly inspired by Gustave Courbet’s now-lost painting of stonebreakers, which was first shown in 1851. 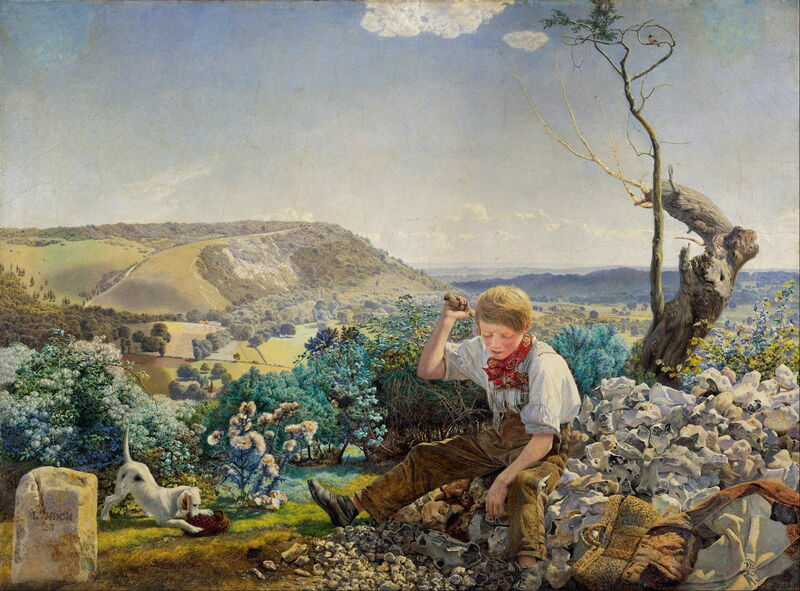 John Brett (1831–1902), The Stonebreaker (1857-58), oil on canvas, 51.5 x 68.5 cm, Walker Art Gallery, Liverpool, England. Wikimedia Commons. The Stonebreaker (1857-58) was painted closer to home, at a popular ‘beauty spot’ in the south of England, near Box Hill, which dominates the distance. The milestone at the left shows the distance to London as 23 miles, and David Cordingly considers this places it along a historic track known as Druid’s Walk, which leads from the Pilgrim’s Way, over the Leatherhead Downs to Epsom and London. This time, perhaps following his experience in Switzerland, Brett made extensive sketches and studies of the motif, and worked on the final oil painting for at least twenty days en plein air, but then completed it in the studio during the following autumn and winter. The painting was shown at the Royal Academy in 1858, where it aroused considerable critical interest. In the summer of 1858, Brett set off again to the Alps, where he ended up painting a second remarkable mountain view, this time at Val d’Aosta in north-west Italy. Val d’Aosta (1858) was painted from a hill about a kilometre north-east of where Brett was lodging, according to Christopher Newall. In contrast to Glacier of Rosenlaui, Brett augments the geological details in the foreground with a sleeping woman and a brilliant white goat. Surprisingly, it omits the fortress of Châtel Argent and the Château de Saint-Pierre, although these appear in sketches which he made at the time. The only buildings which are shown are smaller, more rustic farms and dwellings, set in finely detailed orchards, vineyards, and pastures. Probably started with a series of studies and sketches, Brett seems to have worked on the oil version in front of the motif, then brought it back to England for completion during the late autumn of that year. He considered it finished by Christmas, and it was exhibited at the Royal Academy in 1859. Ruskin’s remarks were uncommitted, and the painting did not even have an offer made for it. Brett then tried for success with figurative and genre painting, and it was not until 1861 that he returned to attempt any more proper Pre-Raphaelite landscapes. He first visited Florence in November 1861, and a year later left England to work on his next major work, a view encompassing almost the whole of the city which had been the cradle of much of the southern Renaissance. 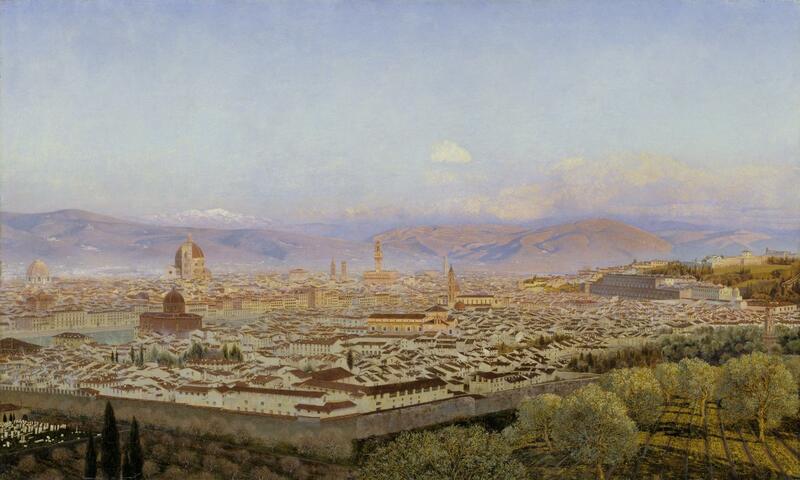 Florence from Bellosguardo (1863) was probably started in January 1863, and painted without the aid of significant preparatory studies, and entirely from the motif. Even with Brett’s apparent eye for fine detail at a distance, much of it must have been painted with the aid of a telescope, and it has been suggested that he may also have used a camera lucida and/or photographs. Regardless of how he managed to paint such great detail, it is a triumph of painting, both technically and artistically, and it came as a shock when it was rejected by the Royal Academy in 1863. Thankfully for Brett, the painting was purchased in May 1863 by the National Gallery, and he was acclaimed in the press as ‘head of the Pre-Raphaelite landscape school’, although by that time he was probably the last of its practitioners. Brett had also intended the painting as homage to the Brownings, and enjoyed the support of Robert Browning through that difficult period. Brett did not hang around in England after this, but later that summer was in Italy again working on further paintings. 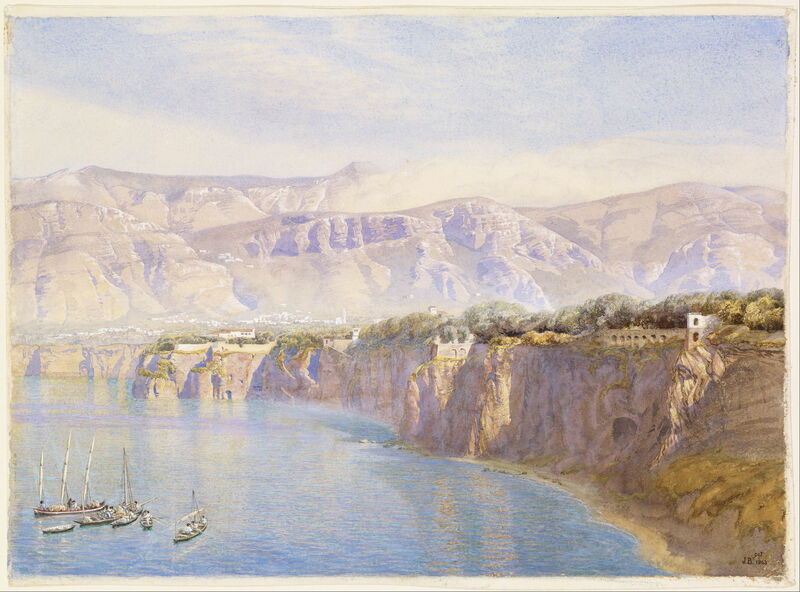 Near Sorrento (1863) is a watercolour which Christopher Newall believes to have been painted from the Via del Capo, and shows the coastline which is at least five kilometres from that point, making it almost certain that its fine foreground detail was painted with the aid of a telescope. It still conforms to the basic requirement of a Pre-Raphaelite landscape, with that detail, its bright colours, and careful depiction of geology. 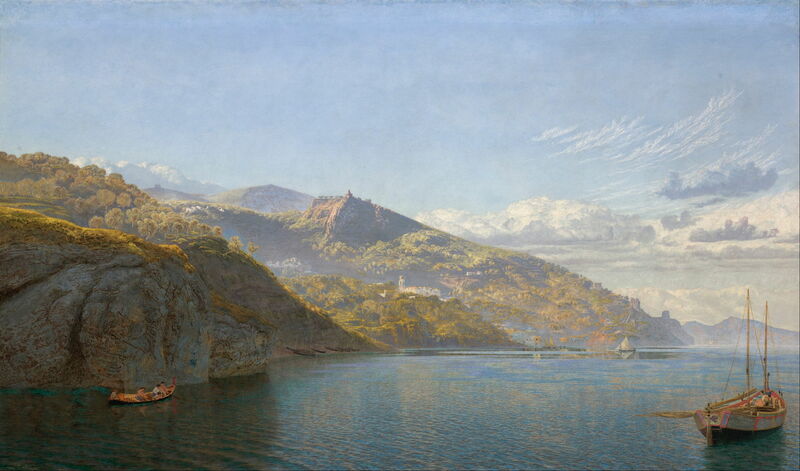 Massa, Bay of Naples (1863-64) is perhaps the most spectacular of the oil paintings which Brett completed during this Mediterranean campaign, and appears to have been painted from a vessel on the water. He had travelled there on board the SS Scotia, although it is unclear whether that ship served as his floating studio, or he may have transferred to another. The Scotia arrived in the Bay of Naples by 9 September, following which he went to stay in Sorrento, then Capri by November. It is therefore likely that he continued to work on this canvas during the winter of 1863-64. To his delight, Alfred Morrison bought this painting on 6 May 1864, for the substantial sum of £250, although Morrison may actually have paid in guineas. Brett was to benefit further from Morrison’s generous patronage. By August in 1865, Brett could afford to buy his own yacht, and he thereafter concentrated on painting in British waters. 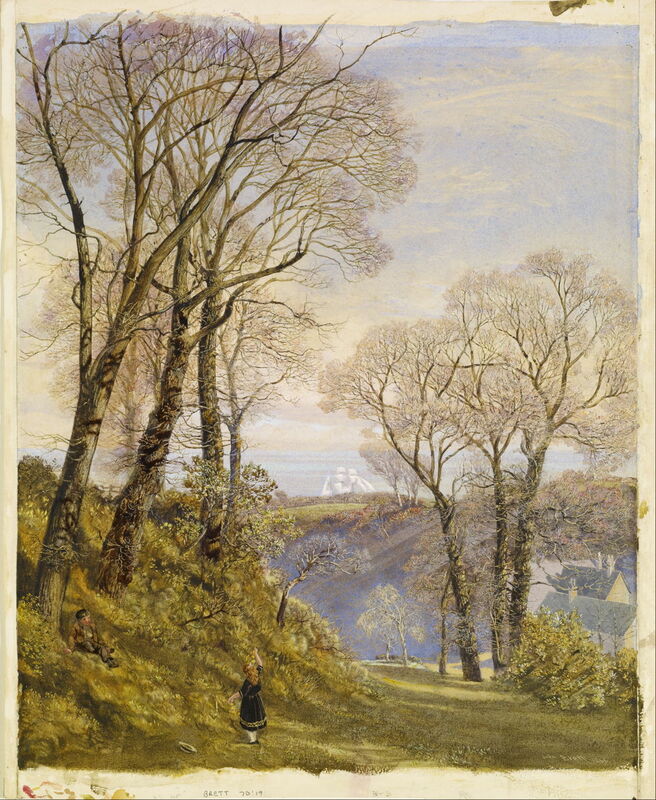 John Brett (1831–1902), February in the Isle of Wight (1866), watercolour, bodycolour and gum on paper, 46 x 35.4 cm, Birmingham Museum and Art Gallery, Birmingham, England. Wikimedia Commons. During the winter of 1885-86, Morrison remained on or near the Isle of Wight, where his new boat had been built. He painted two watercolour landscapes of the Island, of which only February in the Isle of Wight (1866) has been traced. Although a superb painting, its style is starting to drift away from the principles laid down by the Pre-Raphaelites. Cordingly D (1982) ‘The Stonebreaker’: and examination of the landscape in a painting by John Brett, Burlington Mag. 129, March 1982, pp 141-145. 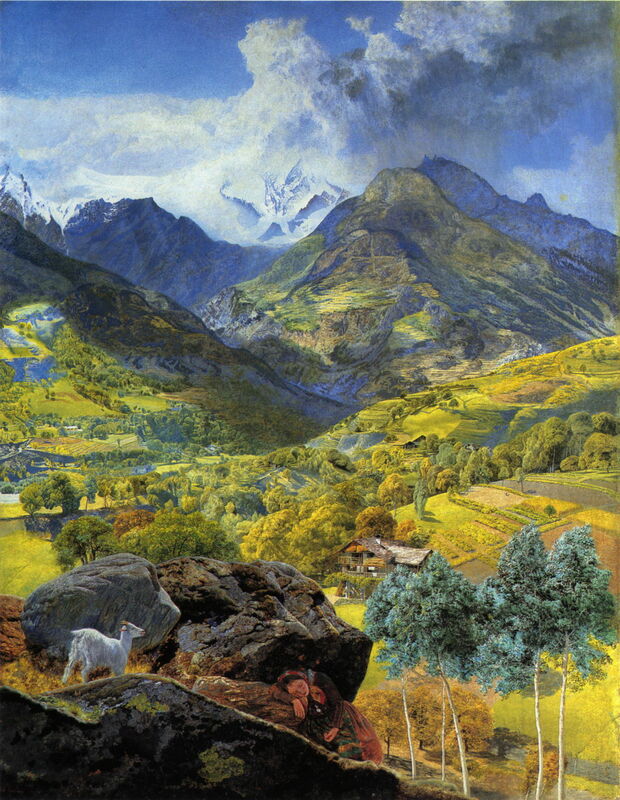 Newall C (2007) ‘Val d’Aosta’: John Brett and John Ruskin in the Alps, 1858, Burlington Mag. 149, March 2007, pp 165-172. Posted in General, Painting and tagged Brett, Hunt, Inchbold, landscape, painting, plein air, Pre-Raphaelite, Rossetti, Ruskin. Bookmark the permalink.